This is hardly a forgotten book -- it's one of those old bestsellers that has remained popular for a long time, though when it first appeared I bet few would have predicted that. In 1912, before such a thing as SF existed as a separate genre, I'm not sure how the serial in All-Story called "Under the Moons of Mars", by "Norman Bean" (the magazine editor's typo for "Normal Bean"), was received. Probably simply as an adventure story, one that harkened back pretty clearly to the lost race tales of the likes of H. Rider Haggard. (And to be sure at the very same time Edgar Rice Burroughs was publishing the first of his Tarzan stories, which much more overtly can be placed in the "lost race" lineage.) 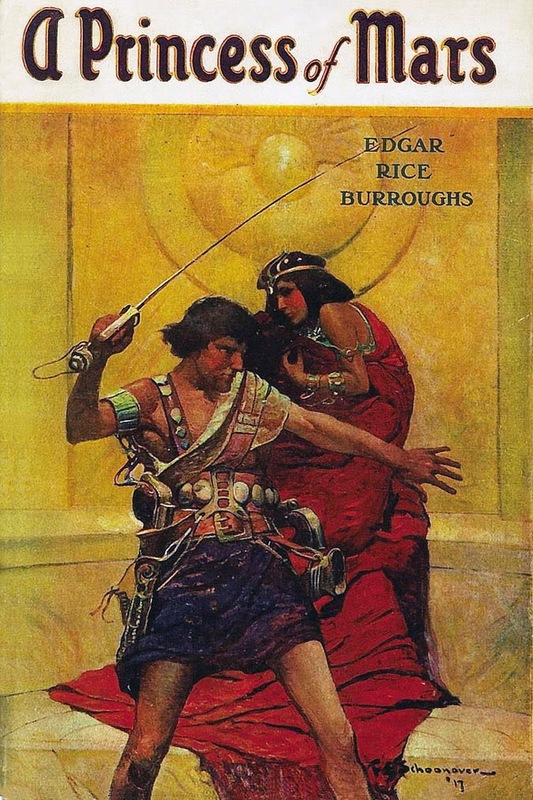 "Norman Bean", of course, was a pseudonym for Edgar Rice Burroughs, and in 1917 "Under the Moons of Mars" was reprinted in book form as A Princess of Mars, under Burroughs' own name. (As far as I or anyone I have asked can tell, the two versions of the story are identical. Burroughs (1875-1950) was born in Chicago. He had a spotty early career, attending a couple of private high schools, failing to get into West Point, and serving briefly as a soldier before being invalided out. He worked for his father's company for some years, apparently with little distinction, before decided that he could write stuff better and more interesting than the junk he was seeing in pulp magazines. And he was right ... "Under the Moons of Mars" was his first sale, followed quickly by the first Tarzan story. Tarzan made it to book form first, but by 1917, with four further Barsoom serials already having appeared in magazines, A. C. McClurg published . Interestingly, Burroughs is the great-grandfather of one of my favorite movie directors, Wes Anderson (The Grand Budapest Hotel). How necessary is it to describe the plot of A Princess of Mars? Briefly, Civil War veteran (for the South) Colonel John Carter and a friend discover a gold mine in Arizona. They run afoul of Indians, and while hiding in a cave, Carter is mysteriously transported to Mars. There he encounters the rather brutish "Green Martians", and is taken captive by them. They are constantly battling each other, and the rather more civilized (and humanoid, though egg-laying) "Red Martians". They capture a Princess of the Red Martians, the beautiful Dejah Thoris. After a rocky start, John Carter and Dejah Thoris fall in love. The leader of the Green Martians plans terrible tortures for them, so it becomes necessary to escape. They become separated, and Carter makes his way to a rival city of Dejah Thoris's. He and a friend plot to undo the dastardly plans of this rival city, and rescue Dejah Thoris's city, which they do in very adventurous fashion. By the end, John Carter has managed to effect positive political change among both the Red Martians and Green Martians, and he and Dejah Thoris are husband and wife, awaiting the hatching of a child, when a crisis in the air-manufacturing plant intervenes. The whole thing is a wild mess of faintly plausible SFnal ideas, totally ridiculous SFnal ideas, and pure fantasy. Much is absurd, but much is really quite fun. The writing is rather stilted but occasionally striking. The characters are very stiff. The attitudes are consistent with the time -- the references to Indians are pretty racist, and there is no reason to believe that the Confederate John Carter would be any more admirable in his attitudes toward black people, but on the whole these aspects are much in the background. It can't be regarded as a great book, but it remains appealing. Philip Wylie was once a very famous writer, both for his polemics and his fiction. He was born in 1902, died in 1971. Much of his work was SF, though he did not work within the confines of the genre. His most famous novel may be The Disappearance (1951), in which the world splits into two timelines, one with all the men, the other with all the women. His two collaborations with Edwin Balmer, When Worlds Collide (1933) and After Worlds Collide (1934), concern a rogue planet colliding with Earth, and an escape to the planet's moon. They were very popular, and a movie was made in 1951, produced by George Pal (and departing quite a lot from the plot of the novels). Wylie's non-fiction screed Generation of Vipers (1942) also attracted a lot of attention. Novels like Gladiator (said to be an inspiration for Superman) and The Savage Gentleman (said to be an inspiration for Doc Savage) also were noticed. He also wrote a great many stories about deep sea fishing, featuring the characters Crunch and Des: these appeared regularly in the Saturday Evening Post, and became a TV series in the 1950s. Many of his later novels concerned nuclear war, and close to the end of his life he wrote the screenplay for a special episode of the TV series The Name of the Game, set in LA in 2017: this episode was directed by a very young Steven Spielberg. Wren's family members gained a bit of notoriety, in one case quite tragically: his niece Janice Wylie was murdered with her roommate in 1963 in a famous case called the "Career Girls Murder". A man of limited intelligence was originally charged with the murders and was coerced into confessing ... he was eventually exonerated and the actual murderer was caught, but the case was one of those that led to the Miranda rules. Janice Wylie's father Max was an advertising man and a novelist. Philip Wylie's daughter Karen Wylie Pryor wrote an influential book on breastfeeding, and was married at one time to Charles Lindbergh's son Jon. Though his reputation was well-established in the literary world, a quick look at the above list shows an abiding interest in genre fiction, including outrightly pulpy stuff. (He also wrote some mysteries.) But he did also write straightforward literary fiction, and one perhaps his best-known effort in that vein is Finnley Wren, from 1934. I say best known, but I have to confess that while I was very familiar with The Disappearance, Generation of Vipers, and When Worlds Collide, and had at least heard of Gladiator, I had no idea Finnley Wren existed until Gregory Feeley pointed me in its direction a couple of months ago. Based on that, I think it qualifies this days as a largely forgotten book. Finnley Wren appeared during a period of tremendous productivity for Wylie: he published 10 novels between 1928 and 1934, three in that last year alone. It has a long subtitle that describes the novel reasonably well: "His Notions and Opinions together with a Haphazard History of His Career and Amours in These Moody Years as well as Sundry Rhymes, Fables, Diatribes and Literary Misdemeanors". My edition is the Thirteenth Printing, from Rinehart and Company (owned by Mary Roberts Rinehart's sons). It is marked by some minor typographical experiments ... not sure how they are reproduced in newer editions. It opens in a bar in New York, on a Friday afternoon, in perhaps 1932 or 1933. The narrator, Philip Wylie, at loose ends because his wife is traveling to the Caribbean, meets a man named Finnley Wren who starts to tell him the story of his life. Much of the early history of his life is given in a few long conversations over the next couple of hours -- Finnley was born in South Dakota in 1900, went to elementary school there (described cynically), had a brother and sister named Tom and Vi. (I thought of T. S. Eliot and his wife, called Tom and Viv: I am sure Wylie was not thinking of them.) Sometime in Wren's teens they moved to New Jersey. At a dance just before going to college Finnley is spurned by his longtime sweetheart, and ends up sleeping with another girl, who then accuses him of getting her pregnant, even though the baby shows up far too soon to be his. Finnley is ostracized, and ends up playing piano on a cruise ship heading to Europe, where he is seduced by the wife of an advertising man and then falls in love with her daughter. After some travail, they get married and Finnley takes a job working for his father-in-law ... and at the time of the story, he is a fairly prominent advertising man, though no longer married to his boss's daughter. All this seems quite simple but there is much more going on ... vicious description of Finnley's rather awful father ... revelation of Finnley's early loss of faith and his cynicism about education and women ... portraits of his brother, sister, and mother, all of whom he loves but all of whom seem weak ... etc. etc. The novel continues as Finnley takes Wylie to a strange party on Long Island, where Wylie seems ready to sleep with a beautiful married woman but instead inveigles from her the story of Finnley's horrible second wife, who decided to become a single mother despite having no intention of raising the child, and who ruins another man's life in the process. We learn what happened to Finnley's first wife (a rather gothic tale) and the also rather gothic tale of his second wife's pregnancy. Wylie eventually sleeps with a different woman, a nice but apparently stupid chorus girl ... but she has a secret too. There are brief cynical depictions of the other people at the party, an apparently typical messed up bunch of affluent New Yorkers and suburbanites. We see a couple of Finnley Wren's efforts at fiction, which he calls "Epistles", and which are fable-like SF stories actually. It's a curious construct, this novel. Much of it is indeed given to Finnley Wren's Amours, and much to Fables and Diatribes (not just by Finnley), and there is plenty of often cynical philosophical musing. It is often funny, but sometimes quite tragic. It is certainly polemical. And in the end, one realizes somewhat unexpectedly that Finnley Wren is actually a somewhat ordinary man -- after all, he's in advertising. Perhaps that's the point -- the extraordinary ordinary life. Or perhaps he's a tragic case ... trapped in a career unworthy of his talents. Or perhaps it's just a story of its time. Kingsley Amis (1922-1995) is one of my personal favorite writers. He's best known for his many novels, mostly comic novels set in contemporary Britain, including of course his first novel, and still most famous, Lucky Jim; his Booker Prize winner, The Old Devils; Ending Up; The Alteration, The Green Man; Take a Girl Like You; and many more. In addition to novels he wrote a fair amount of reviews and criticism and some poetry. (He was one of the Movement poets, a group of poets in the UK in the 50s who pushed for more natural imagery and emotion, and somewhat more traditional forms: others included most notably Philip Larkin (the best of the Movement poets and probably Amis' best friend), but also Elizabeth Jennings, Robert Conquest (another great friend of Amis and best known as a Sovietologist), Donald Davie, and one or two more.) Amis was an SF fan, and he is famous within the genre for writing one of the earliest academic studies of genre SF: New Maps of Hell. He also wrote several SF or Fantasy novels: most obviously The Alteration (an alternate history set in a Catholic-dominated world) and The Green Man (a ghost story in which God is a character); but also Russian Hide-and-Seek (set in 21st Century England under Russian rule), The Anti-Death League (near future to its time of writing, tangentially about the development of a secret weapon), and Colonel Sun (as by Robert Markham, a James Bond novel). (Ending Up is also set in the future, but it's not precisely easy to notice that. Amis also wrote a fairly small quantity of short stories, no more than a couple of dozen in about 40 years of active writing. His imagination was clearly a novelist's imagination. I had previously read his collection Mr. Barrett's Secret, which I believe included most or all of his post-1980 stories. I have just finished his Collected Short Stories, which was published in 1980, and includes everything Amis felt worthy of preservation at that time. (It subsumes a previous collection, My Enemy's Enemy.) Amis in his introduction somewhat sardonically mentions that he felt his story "The Sacred Rhino of Uganda", written when he was a schoolboy, was "uncharacteristic" -- it's not clear to me, though, whether there were other stories written and published during his adulthood that he also declined to collect. Interestingly, the great bulk of Amis's short stories seem to be genre pieces. Most or perhaps all of the stories in Mr. Barrett's Secret qualify, as I recall. (Not necessarily as SF: the title story is historical fiction (about Elizabeth Barrett's father) and another story is a spy story.) In Collected Short Stories, the first six are pretty standard contemporary mainstream fiction, but the remaining 10 are all genre pieces: several SF stories, a vampire story, an odd thriller about strange goings-on in Crete in 1898 that may not be precisely SF, fantasy, or a spy story but combines them all in a curious fashion, a "weird tale", and a Holmes pastiche. The three opening pieces are linked stories about a Signals unit in the British Army, in the days just after the end of World War II. Amis is rather cynical about the quality of officers. The first two stories. "My Enemy's Enemy" and "Court of Inquiry", put a somewhat sympathetic main character in a sticky moral situation and watch him fail. The third, "I Spy Strangers", is set against the post-war election that gave a huge majority to Labor: a somewhat foolish Tory officer is shown gobsmacked by this. "Moral Fibre" appears perhaps to feature the protagonist of Amis's second novel, That Uncertain Feeling, though he denies in his introduction that the story is an outtake from a draft of the novel. A pushy social worker tries to set a sluttish lower class girl straight (she has a baby at the age of 16 or so and quickly turns to prostitution), but the social worker's insensitive actions only make things worse. "All the Blood Within Me" is a subtly devastating look at the relationship between three people: a man and his wife, and their old friend who has always hopelessly loved the wife. At the occasion of the woman's funeral, we meet the old friend, and he reminisces on his idealized view of their old friendship and his perception of their characters -- only to have his views challenged in a short conversation with the couple's daughter. "Dear Illusion" is a rather intriguing story, in which Amis gets in his whacks against pretentious meaningless contemporary poetry (i.e. everything the Movement was against). A journalist interviews a celebrated poet about his methods, and learns that he (the poet) isn't really sure he's any good. The poet threatens to quit, but instead produces one last book, to great acclaim. The journalist gets one more interview, after reading the book in horror: the poet admits to have written these last poems more or less randomly, in an attempt to see if his readers can be trusted -- of course, they can't. Part of this is Amis's rather Blimpish anti-Modernism, and rather crude in that way, but his portrayal of the poet, seen through the eyes of the journalist, manages to be quite moving. There are three slight, humourous, SF stories about the future of drinking, "The 2003 Claret", "The Friends of Plonk", and "Too Much Trouble". In each story a man is sent forward in time, and after gathering data on the general state of future society he manages to end up in a drinking establishment, learning horrible things in each case about the future degradation of drink. Slight and faintly amusing stuff, but pretty minor, with jokes on the level of the acronymic names of the time travelling equipment: TIOPEPE, TIAMARIA, TAITTINGERS. "Hemingway in Space" is just what the title might lead one to expect: a parodic recasting of a Hemingway story (in this case "The Short Happy Life of Francis Macomber") as SF (i.e. the hunt occurs with blasters in the orbit of Mars). "Who or What Was It?" is a pretty neat story, a piece of metafiction in which Amis and his then wife Elizabeth Jane Howard are portrayed as visiting an inn that coincidentally bears considerable resemblance to the title inn of his novel The Green Man. The Amis character in the story decides that he is fated to reenact an encounter from the novel (in which the protagonist faces a terrifying monster made of foliage, a "green man"), with curious results that lead to a very nice closing stinger. "The Darkwater Hall Mystery" is a Holmes pastiche, though Holmes does not really figure in it. Watson orders Holmes to take a couple of weeks of rest, and in the great man's absence he consents to substitute for him and investigate a threat on the life of a baronet at his country home. The real interest in the story, of course, is the portrayal of the various characters: Watson, the baronet and his beautiful wife, the baronet's dissolute and bitter twin brother, another guest, an Army veteran, who is besotted with the wife. The "mystery" is (quite on purpose) almost trivial. Not a particularly great story, but interesting. "The House on the Headland" is the Cretan story, in which a pair of British spies, keeping on eye on Crete as the Turks leave, investigate strange goings on at the title house, which turn out to have little indeed to do with international affairs. Finally, "Mason's Life" is a short-short that originally appeared in the Sunday Times, though I read it years ago in a volume of the Aldiss/Harrison Best SF of the Year series. It's slight, but not bad, about a man in a bar confronted by another man, who insists that he must be a figment of that man's dream. Leading to a quite predictable resolution. One certainly comes away from this volume convinced that Amis was first and best a novelist, but on the whole it is still pretty enjoyable reading, and occasionally quite good indeed. Charles Major was an Indiana lawyer (and one-term state legislator), born in 1856 in Indianapolis, a graduate of the University of Michigan, and resident in Shelbyville (only 30 or so miles SE of Indianapolis) for most of his adult life. He died quite young, in 1913. When Knighthood Was in Flower was his first novel. He closed his law practice after its success and continued to write. He had one more major bestseller, Dorothy Vernon of Haddon Hall (1902), set in Elizabethan times (and later filmed starring Mary Pickford). He wrote several more historical novels, as well as a few children's adventure stories set in Indiana. Major published When Knighthood Was in Flower under the pseudonym "Edwin Caskoden", partly perhaps to avoid interfering with his law practice, but also as part of the novel's conceit: the narrator is named Edwin Caskoden, and the story is presented as being an edited version of Edwin Caskoden's memoir, done by his distant descendant of the same name. Not surprisingly for such a successful book, it became a successful play and movie. The first movie version was as early as 1908, produced by D. W. Griffith, and retitled When Knights Were Bold. (No copies survive.) The next version was made in 1922, and starred William Randolph Hearst's mistress Marion Davies. Finally, Disney made a live-action movie in 1953, renaming it (in the US) The Sword and the Rose. My edition of the book is a Grossett and Dunlap reprint, called the "Theatre Edition", presumably because it is illustrated with still photos from a production of the play. (That seems to have been common at that time. The picture I have so clumsily reproduced above (my son not being available to do the photography) is of Roselle Knott playing Mary Tudor, though the role was actually originated by Shakespearean actress Julia Marlow.) This edition is undated, but may have appeared in 1907, as it is inscribed "Mr. Virgil S. Kenninger, from Mamma, Christmas 1907". At least by the time this edition appeared, Major was acknowledging his authorship: the title page says "Rewritten and rendered into modern English from Sir Edwin Caskoden's memoir by Edwin Caskoden (Charles Major)". The original publisher was Bowen-Merrill, the predecessor to the Bobbs Merrill publishing firm. Bobbs-Merrill was best known for publishing The Joy of Cooking, as well as L. Frank Baum. They were based in Indianapolis, hence the connection to Major: a salesman for the firm tried to sell him some law books, and instead he brought back a copy of the manuscript. "Charles Major's works will be long remembered in American literary history. To be thoroughly honest and objective, however, we must admit that, dear as they are to the hearts of Hoosiers, their place has not been determined by intrinsic literary merit. They have the characteristics of the historical novels of the time -- overly rhetorical and bombastic language; heroes possessing impossible skill, bravery, and foresight; plots determined largely by coincidence. Modern critics do not always deal kindly with Major. One contemporary scholar writes: "Although his importance may be said to be entirely in the historical field, Major made no real contribution to the development of the historical novel created by Scott and Americanized by Cooper. He had their faults but seldom possessed their powers." But the books do tell an exciting story, and Major certainly holds his own in the genre with his contemporaries: writers like Maurice Thompson, George Barr McCutcheon, and the early Tarkington." Baetxhold was quite wrong in his assertion that Major's works will be long remembered -- they are now nearly forgotten. But I think he, and the scholar he quotes, are also off the mark in their judgement of his work. Major, at least in this first novel, is not terribly bombastic in his language, and while the primary hero does possess unusual skill, and lots of bravery, and perhaps overemphasized virtue, the plot is not really driven by coincidence at all, and in fact much goes wrong for the characters. But most of all, the chief virtue of this book is one seemingly completely missed by those commentators: the narrative voice of "Edwin Caskoden", which is a purposely self-deprecating mixture of some pomposity, some family pride, and lots of (probably deserved) modesty about his abilities in certain spheres. Moreover, he is witty throughout, and plausibly and funnily observant about most of the characters around him (the perhaps too perfect hero, Charles Brandon, excepted). It's really not bad stuff at all, though it's not earthshakingly great either. The novel's title comes from a couplet by Leigh Hunt: "There Bred a Knight, when Knighthood was in flow'r/Who charmed alike the tilt-yard and the bow'r". The novel has a long subtitle: The Love Story of Charles Brandon and Mary Tudor, the King's Sister, and Happening in the Reign of His August Majesty, King Henry VIII. It opens with a preface detailing the supposed origin of the story: one Edwin Caskoden gives a short history of his often illustrious family, especially noting how one of his ancestors made a fortune by wisely ignoring the then King's cuckolding of him, instead gaining favor and selling him lots of jewelry (he was a goldsmith). The goldsmith's grandson is Sir Edwin Caskoden, Master of the Dance for King Henry VIII, and the story is supposed to be a rewritten extract from his memoirs. Caskoden tells of Charles Brandon, a commoner who had made something of a name for himself by fighting in the wars in Europe, and who after returning home, fought a duel with a man famous for having killed numerous men in other duels, including Brandon's father and brother. It turns out the other man was a cheater, wearing mail under his clothes, and Brandon disarms and blinds him. His fame leads to an invitation to King Henry's court. As Caskoden notes, the King's 19 year old sister, Mary Tudor, is the leading beauty of the court, and many men had fallen for her only to be rejected (Caskoden included, though on the rebound he started courting Mary's best friend, in the end successfully). Naturally he assumes that Brandon will fall for her too, which could be disastrous as he is a commoner. The two men are soon close friends, and by convincingly feigning complete indifference Brandon manages to attract Mary's attention. Before long the two are completely in love, to Henry's anger, as he wishes to marry her off to the aging King Louis of France. A further complication comes from a former suitor of Mary's, the dastardly Duke of Buckingham, who attempts to disgrace Mary when she makes a visit to a fortuneteller who happens also to run a house of ill repute. When Brandon rescues the girls, he kills two of Buckingham's hired men, and Buckingham has him thrown into prison. Brandon is finally released and plans to travel to New Spain (i.e, America) because he knows that the King will have him executed for daring to mess with his sister. Before long Mary plans to come along with him, dressed as a man, but that plan fails because she it too beautiful to pass herself as a male. Brandon ends up in the Tower, and Mary can only save him by finally promising to marry the French King. The rest of the novel is fairly true to the historical record ... the King of France dies soon after the marriage (Caskoden suggest, and in fact contemporary wags thought so as well, that Mary (presumably on purpose) wore the old man out), and Brandon goes to France and secretly marries her, despite the odious attentions of the Dauphin, the new King (a married man it should be noted). Henry VIII makes the best of things by making Brandon 1st Duke of Suffolk. Major claimed to have deviated from the historical record only in small ways (Brandon's father is supposed to have been killed by Richard III, not in a duel; and Brandon was given his titles before marrying Mary Tudor); but there are other departures. Most obviously, the novel's Brandon is portrayed as quite young and unimportant, but in fact he was 31 in 1515 (when the action takes place), and had already been married twice (scandalously, Wikipedia says) and widowed twice, and was engaged to his 8 year old ward, Elizabeth Grey. He married another ward (this one 13) after Mary Tudor's death. Clearly not the paragon portrayed in the novel -- though he was in fact a notable soldier, and a very influential man in Henry's court. He and Mary were the grandparents of the tragic near-Queen Lady Jane Grey. One of the great mid-20th century English writers was Elizabeth Taylor (needless to say, not the actress). Taylor, daughter of an insurance inspector, was born in 1912 and died in 1975. She married John Taylor, who owned a candy company, in 1936. Her friend the novelist Elizabeth Jane Howard declined to write a biography of Taylor due to "lack of incident" in her life, though as Taylor was notably a very private person, it may be that Howard was simply deferring to her friend's presumed wishes. This book certainly wasn't a "bestseller" -- none of Taylor's novels were. She might have been in danger of becoming forgotten at some point, but her champions such as Howard, Amis, and Anne Tyler have kept her novels in people's minds. Many of her books were reprinted in trade paper by Virago Press, a feminist imprint, in the 1980s. My copy of the book at hand, Palladian, is the Virago reprint. Taylor's work got some more notice in the 2000s with the appearance of a couple of movies based on her best-known novels, Mrs Palfrey at the Claremont (starring Joan Plowright) in 2005, and Angel (starring Romola Garai) in 2007. 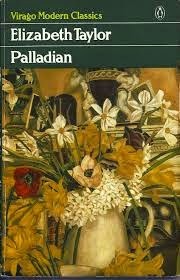 Palladian is her second novel, from 1946. The nominal protagonist is Cassandra Dashwood, who becomes governess to Sophy, daughter of a rather ineffectual widower, Marion Vanbrugh, who lives in a decayed manor house with his drunk cousin Tom, Tom's pregnant sister Margaret, a couple of not very respectful servants, and Tom and Margaret's somewhat dotty mother. Cassandra is a romantical young woman who determines in advance to fall in love with Marion. And so she does. But that is a small part of the story. More important, perhaps, is Tom's tawdry relationship with the local publican's wife, and Tom's secret past involving Marion's dead wife. There are also telling tidbits from the POV of the two servants. Margaret's rather bossy and excessively bracing nature. Sophy is depicted as a pretty normal girl of her age, not at all a prodigy, desperate about her failure to be the beauty her mother was. The novel turns on a shocking event with about 40 pages to go. I admit I put the book down for a day or so at that point -- it seemed unearned, unfair. But -- though I am still unsure that that plot development works -- Taylor still brings home the novel quite effectively. It's by no means her best novel, but it's fine work. Delicately funny, acute, honest about its characters' failings but still fair to them. Taylor was a fan of Jane Austen, which is fairly clear in all her work, but perhaps never more so than here, as indicated by her protagonist's name, by the reference to the Greer Garson*/Laurence Olivier vehicle Pride and Prejudice, which is shown at the local theater, and by a couple further overt references to Austen.